Satish Mathur. 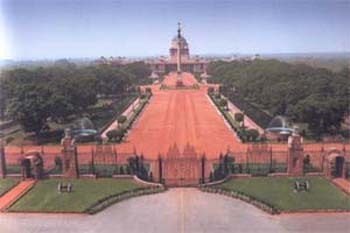 President’s Secretariat, Rashtrapati Bhavan, Delhi. Pages 163. Rs 2,100. THE most magnificent residence of the head of any democratic state, Rashtrapati Bhavan towers above the other edifices of Lytton’s Delhi. Inaugurated in 1931, the building had taken 20,000 workers and 3,000 stonecutters 17 years to build, mainly because of World War I. It is a four-storey high, 285-room mansion, set in an H over 2,10,430 sq feet. What a grand place it is, so much so that after the first Viceroys who lived in it, the first and only Governor General of India, C Rajagopalachari, and the 11 Presidents who followed him have also chosen to live in the relatively modest southwest wing instead of the suites meant for the Viceroy and the Vicereine which are now kept ready for visiting state guests. The State Ball Room was rechristened Ashoka Hall, where swearing in of the Cabinet and other ceremonial functions take place, and instead of the classical western music, now the National Anthem is played from the bandstand. From 1948-1951, the Durbar Hall served as a repository of rare artefacts and even became a venue for a public exhibition while the National Museum was being built. As times rolled by, Rashtrapati Bhavan became more and more open to the public. The Mughal Garden is open to the public in February-March every year; the President, Dr A. P. J. Abdul Kalam, has a fresh focus on children. Visitors start with a virtual tour in the reception area, and are allowed in increasing numbers to the new science museum, biodiversity park, kitchen museum and the five new gardens with musical fountains. The President’s Secretariat and the author have done well to bring out this somewhat expensive coffee table book highlighting the various aspects of Rashtrapati Bhavan. Even as it still retains the touch of bureaucratic writing, it is a welcome addition to the growing volume of literature on this magnificent building and its environs. The scale and grandeur of Rashtrapati Bhavan was brought home in the ’80s, when, soon after spending some time in the grandest edifice in India, this reviewer had a chance to visit the White House. There was simply no comparison—the Marvel on Raisina Hill is indeed, Mansion Nonpareil.